It has been a while since there has been something new on the search scene. There was one highly publicized, incomplete junk that came out a few months ago called cuil (pronounced cool). As the name portends, it was not. At all. Anyway - a new site called Wolfram|Alpha (name rather unfortunate) - is the new kid on the block bringing forth a really different approach to search. Instead of searching through pages to suggest potentially relevant pages, WA tries to answer quantitative questions with just the answer. If you need to know the population of the world, you just ask 'world population' and you get the answer of 6.53 billion people. Search is tough. Understanding and algorithmically analyzing human fuzzy interaction is inherently difficult. And WA is trying to do two things at once - understand the fuzzy world-wide-web and obtain facts from them. This has long been the goal of a semantic web, that is nowhere near reality today. At the same time WA is trying to understand user searches to generate quantitative queries that can then be applied to the data that it has collected earlier. First impressions - WA seems to be doing an ok job on the two entity intersections. If you are looking for 'world + population', you are good. Or you are looking for 'India + mobile phones' you are good too. But trying to do an intersection of 'world + population + mobile phones' seems to trouble the search engine. Another disappointing aspect is its inability to interpret date and time as a dimension to queries that seem to work well on 'today'. For example, searching for gold + price works well. But trying to search for gold + price + any date doesn't compute. This seems to work for dow jones + any date, but not for gold + price. See similarities to the third level intersection problem observed above? What it seems to be doing a good job is on the roll-ups. Try searching for Asia + cellular phones. You not only get the total estimate for Asia, but you also get a list of all the countries with their estimated cellular phone populations. Pretty interesting eh? All in all, WA looks like a good for an alpha. It seems to be able to do simple queries and roll-ups. Not really good with anything complex, not to mention numerous glitches in the UI of the site. Also interesting will be the response from rights holders to their data being used by the engine. Granted 'facts' do not fall under the purview of copyrights. But what would happen if, say, results from surveys started to be incorporated into search results? That is if WA can one day show you the percentage of all people in United States, having cell phones with AT&T service expressing satisfaction with their service in a survey. What will the survey owners think of that? What will AT&T think of that? All in all, am really excited to see where this goes. Here to the semantic web, without having to work hard at it. When I re-started the blog a few days ago, one thing that played on my mind was the audience or lack of it. Over the last few years, I had been indoctrinated incessantly over the need to line up messages to an audience. Writing without an audience, as with this blog, seemed to be a hark to the old days and the old ways. That is when I realized that the joy in what I did on this blog was for me and me alone. Writing is something I liked to do, and this provided a means for me to instinctively fulfill that urge. The website provided me with a means to basically bring together stuff I did over time to one place. There was a definite satisfaction in seeing a project come to fruition, the beats having to pander (!?) to an audience. To action alone hast thou a right and never at all to its fruits; let not the fruits of action be thy motive; neither let there be in thee any attachment to inaction. It is the joy of writing and working on my website that is my biggest gain. And thus I go, talking to myself. What did jQuery do? Well, check out the neat plugin for jQuery, that allows you to sort tables on the fly. Nokia has done a very good job with the hardware requirements of the 5800. As noted in my earlier posts here and here, there are a number of things to love about the phone. But, as with anything else, there are always room for improvement, and here are some key opportunities. You will see that a number of examples are more interface and software related that could be modified in the future with an upgrade, which only speaks to the solidity of its specifications. Video Acceleration: For all its capabilities, the phone definitely misses that zip 'on the toes' feel factor. It is not so much with the running of an application, as it is apparent with any screen changes. It could be games, switching orientation, changing between applications. There is a nasty delay, not bad enough for you to realize upfront, but just enough to slowly eat away at the quality of your interaction with the phone. What makes it worse is that that whole UI seems to be riddled with hacks to compensate, making interacting with the phone a bit of a hit-and-miss affair. Cramming in just that additional video acceleration, could have freed up resources just enough to make the phone feel a whole lot zippier. Uncomfortable SIM slot: The Nokia 5800 has a unique SIM slot, that involves a notch that needs to be opened and the card slid in. However, to take an existing SIM out, there is no easy way. The back needs to come off, and the SIM forced out using one's nail or the stylus. For anyone who travels with the phone - it is definitely a major annoyance. Thick-headed approach to text input: This is one of the biggest annoyances with the phone. There are a total of four different means to enter text into the phone - QWERTY (landscape), mini-QWERTY (portrait), T9 predictive and handwriting. And you can choose one and only one - changing orientation does not automatically choose an appropriate keyboard. Which means no matter how you are using the phone, when it comes to entering text, you need to change orientation to the method you had set before, and use the keyboard. Here are some potential alternatives - allow preferences for the portrait mode. Switch to a full QWERTY mode for landscape orientation and the preferred mode for portrait. And here is taking it further, be aware of the stylus being pulled out, and maybe switch to the handwriting mode. Contacts bar: Of the two standby screens, one is a contacts bar. Really useful and comprehensive bringing in calls, SMS and email into one location. But, you can only have four friends. And everyone needs to have a picture. And if they have more than one numbers, hard luck - no way to specify (other than setting a default in contacts) which number you want to reach them at. So if your contact does not answer their mobile, tough luck. To try their apartment number, go rummaging through contacts, just like any other contact - rendering the contacts bar useless. No predictive input for QWERTY: Soft keyboards are inaccurate. The Nokia soft full keyboards do not offer any predictive correction of near miss key strokes. They already have T9, this just has to be a different sort of one to many mapping, and having no support at all is a big miss. Large buttons in landscape mode: The phone interface looks comical in landscape. The entire right side of the screen it taken up by big bulky soft keys, creating space for five buttons when applications typically have need for only two. Taking up twice the space required for buttons in the landscape mode is a egregious waste of the gorgeous screen real estate. Browser: In spite of the intermittent tantrums of the bundled browser (where the program just shuts down in a huff), it does a reasonable job rendering the pages. However, the interface definitely needs a lot of tweaking before it is anywhere close to being done. Here are a few examples, there is a full screen browsing mode with no back button. The browser supports tabbed browsing, but you cannot open a second tab unless the website opens a new window. Copy paste doesn't work on web pages. Try to copy the address of your current page - you wouldn't believe the hacks required. This gives you a flavor of the idiosyncrasies of the browser. Applications: S60 V5 breaks compatibility with S60 V3 which in itself has the FP1 and FP2 variants. What this means is that all applications need to be redone for compatibility, and there just aren't enough applications around the 5800 even 5 months after its launch. Scrounging for new applications seems to be the main activity of the blogger groups built around the phone. Nokia did put out some applications and is working on an app store, but they seriously run the risk of alienating developers for mobile platforms by fragmenting their development platforms this way. Soft key for Menu: Every thing on the Nokia 5800 can be done via the touch-screen, except for one and only one thing. Opening the menu, which for some strange reason can only be accessed by using the white menu key. This wouldn't seem that much of an annoyance till you realize that the screen is designed for single-handed use, till the need to use this button makes it impossible. Not to mention, it fully breaks the UI consistency. Clunky inconsistent UI design: Which brings us to the last point - the overall theme of many of the points above. More examples. Contacts uses a good-idea-in-theory-but-bad-in-practice interface where the buttons change based on your contacts and the previously pressed buttons. Something like the NeverLost interface on Hertz cars. That probably never went through a consistency and usability tollgate. Or consider the interface to add contacts on the contacts bar - looks suspiciously iPhoneque, while nothing else on the phone does. I am sure that never went through a consistency tollgate either. Overall the UI design looks like it has been built by engineers to demonstrate touch on the phone as opposed to a consistent user experience. That probably sums up what I think is the biggest fault with the phone. There you go! That should serve as a good list for now. On the whole, the phone is not bad. But if this going to be the future of the touch platform for Nokia, then the platform needs a lot of work. And platform is not just on the phone (i.e., the user interface and the touch enabled S60 V5), but also the community and application universe developed around the application. By all accounts, the buzz around the 5800 has been phenomenal. Now the ball is in Nokia's court. I have had my new Nokia 5800 for about 3 months now, having bought it in January 2009. During the period, it has gone through two firmware upgrades - first from v11.0.08 to v20.0.012, and the second one from v20.0.012 to v21.0.025. The first updated clocked in at about 133 MB and was available only via their NSU (Nokia Software Update) service the second one weighed in at only 4 MB and was available OTA (Over the Air). Of the two, the second one seemed to have worked its magic on the phone, really making the interface more responsive, while the first one delivered the bulk of the enhancements. With two major upgrades in less than 3 months, it is ample proof that Nokia is indeed looking to the Nokia 5800 as a testbed to iron out any and all problems with its touch platform, before it start rolling out the big guns - the E series and the N series. That said, back to the question at hand - what really works with this phone. Sound: The other think you will notice when you play the aforementioned trailer, is the sound. For a tiny set of speakers on a palm-sized phone, the sound is remarkably good. You can actually make out the different frequencies, and including, a very solid handling of base without the expected crackle. Basic phone functions: The Nokia 5800 does a good job at doing what it is supposed to do - act like a phone. It is surprising how many smartphones are so choc-a-bloc with features, that somehow the basic functions of a phone take a back seat. Not with the 5800. Calling, maintaining connectivity, the speakerphone, contact management etc are all exactly as expected. Not having to sacrifice a phone to get a smartphone is a terrific feature of the 5800. Size and Weight: At 109 grams, the phone is surprisingly light. And it fits beautifully in your palm, without being too wide or too narrow in depth. For me, the form factor of an iPhone did not seem as comfortable. The small details, like the recessed edge of the touch-screen, for example, adds a lot to handle of the phone. The build of the phone is pretty solid too. Even though it is built of plastic, there is very little of the plastic-y creaking during operation. Storage: The 5800 comes bundled with a hot swappable 8GB Micro SD card. The hot swap means you do not need to switch the phone off to remove or add the card. Nokia, by bundling in a decent sized card, adds a lot to the bottom line of the deal. Variety of Input methods: One of the advantages of a resistive touch-screen is that you can have input methods other than just the finger. A capacitive screen depends on the capacitive effect of the human finger to register a touch. So, it fails with a gloved hand, or a stylus. The 5800 on the other hand, comes with a stylus, a pluck (ex-guitar pick), finger, finger-nail etc. And taking the flexibility further, the phone comes with a variety of methods to input text - a full QWERTY keyboard, a mini-QWERTY, a T9 style touch input and even a stylus driven hand-writing recognition method. Battery: One of the surprising aspects of the phone is its long battery life. One the days I ignore it, with just a couple of calls, the battery seems to last and last. With a little more strenuous usage, the phone easily lasts a couple of days on a single charge. Of course, no amount of batter-life is enough, but what the phone brings definitely counts as a plus. Multi-tasking: A smart phone is supposed to do more than one thing, at the same time. With one of the three dedicated buttons dedicated to multitasking, it is not an after-thought. That said, the phone does struggle once a number of large applications are running in the background. But as long as you don't treat it like a laptop, it does a pretty good job. Proximity & ambient light sensors: Small capabilities like this get lost sometimes. But the ability of the phone to set screen brightness automatically, switch off when held to the ear all add up to a solid user experience. Other hardware capabilities: From a capabilities perspective, the Nokia 5800 is stuffed. In addition to everything else it comes with an FM Radio and twin cameras including front-facing camera for video calling. The primary camera comes with a short range flash, not for a room, but definitely great for those pub snapshots. 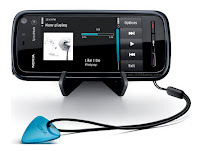 S60 platform experience: The Nokia 5800 is built on top of the S60 platform, version 5. The version 5 is the new touch enabled operating software, that includes sensor frameworks to deal with the other hardware capabilities of the phone. Having the legacy of the S60 platform, means the the basics are already in place. Phone, contacts, copy-paste, application control, basic UI characteristics are all tried and tested. Applications too follow a well established method to interact with the end users. While the 5800 sometimes feels like a clunky touch interface, the core of the system is in place and works like a charm. Price: Has to be one of the best features of the phone. Retailing for under $400 (unlocked and unsubsidized) it is almost half the price of the iPhone and the Sony Ericsson XPERIA X1. Not having to jail-break anything or break warranty for flexibility is one of the best features of the phone. In short, the biggest positives of the phone are its capabilities - the sheer hardware capabilities and the underlying S60 software. Which leaves the interface components and applications. Coming up in the next post - where the Nokia 5800 definitely needs a little help. The Nokia 5800 has been my primary phone for the last three months or so. My earlier phone, the Sony Ericsson T610, was getting old and was in need of a massive update (retirement). Being a Sony Ericsson user, the idea of switching to Nokia seemed pretty unimaginable to me at the time. But try as I might, there wasn't a SE phone that seemed to fit the bill. Having delayed my purchase of a smartphone, my list of requirements seemed to be growing all the time. When I started looking for a phone in late 2007, my list of requirements was driven by the phones at the time, particularly, the iPhone. On a number of levels, the iPhone was almost a no-no from the beginning. I never saw myself buying an Apple product - I adore them, just don't agree with the approach and philosophy of the company. Anyways, driven partly by the iPhone and the other phones at the time, this was a list of parameters I had come up with for my first smartphone. Touch screen: This was a must have for me. The way I saw it, the touch interface was going to be the standard interface philosophy soon, especially in mobile interfaces. Not to say the keyboard would be redundant, but the ability to interact with on-screen elements (for certain activities), without need for surrogates like cursors and element focus seemed to be the natural progression. And I wanted in on that. And for me, the physical keyboard was completely optional. Also, I was not sold on either the capacitive or the resistive touch screens. And so did not have particular loyalties to either camp. Other sensors:Proximity, light and orientation sensors was definitely high on the list. I figured, I will have to carry a second device, that was more focused on communication and email - so why not focus on the fun factor with my personal phone. Lack of an orientation sensor was almost a definite deal-breaker. For a fun phone, that definitely had a big cool factor. WLAN(WiFi): Was another must have. My plan was to have that as the primary means of getting data in and out of the phone. That would also save me a data-plan with my mobile carrier, which were not cheap to come by. 3G: Was optional for me. The way I saw it, the 3G network wasn't ubiquitous enough to base my purchase on being able to use it. Especially given that I would be traveling and therefore not necessarily have 3G coverage all the time. The other side effect of this decision was that I did not have to worry about the NAM and Rest of the world 3G variants before I got my paws on my phone of choice. Quad band: That said about 3G, it definitely had to be Quad band phone. Given, the same traveling nature - I did not want to get stuck with a phone that would not work in all my locations. My SE T610 did not do 850 MHz, and I had done my share of blaming the network (ATT) in public, secretly knowing that my phone was really to blame. Flexibility and Freedom: This was one of the most important requirements. In two ways - firstly I did not want a branded and locked phone. I wanted the flexibility to be able to change SIM cards across different locations. (See need for traveling above). And secondly, I wanted to be able to install and uninstall applications the any way possible. I did not want either my carrier or my phone manufacturer to determine what I did with my phone. The other piece of freedom - access to the file system of the phone, without the need to install a clunky proprietary program. Screen: QVGA (320 x 240) or better. Why? Coz the iPhone did QVGA. Battery: At least 1200 mAh. Again, that did not really mean anything without a strong support from the device itself. I hoped for a regular usage of 2 to 3 days, and heavy use of a day before having to recharge. Application ecosystem: Given that Apple was the only viable option dictated that this was not a necessity. But, as long as I was able to get a system that was open enough - It was a matter of time before people started trying to replicate the App Store. Camera: This surprisingly was not really high on my list. Primarily because, I was yet to see a phone that did a tenth as good a job as my SLR. And there were physical reasons to it - a camera phone had the sensor the size of my pinky toenail. I did not expect to do any serious photography on my phone. On the off chance that I was to witness a UFO landing, I just hoped to have a video mode to create a grainy, shaky, unrecognizable account of the event. Other connectivity (Physical & Bluetooth): Bluetooth was an expected minimum. Physical connectivity was not that important, as long as I had my WLAN access. Memory: Expected a few gigs, but more importantly hope for one with an external card, which could be upgraded as and when I ran out of space on the phone itself. I have a tendency to run out of space - rather quickly. It was neck and neck between these phones (though the Omnia went to the bottom of the pile pretty early) and it seemed just a matter of which price point I was comfortable with. As time went by, the Diamond seemed to slowly but surely rise to the top. XPeria was priced too high, and the screen of the Diamond beat that of the Touch hands down. Until the Nokia 5800 came along. If you look back at the list of requirements I had, you can see how well the 5800 stacks up. Next post - what I love about my 5800.